The choice of what to wear on your legs isn’t that difficult really, as it is down to personal preference. If it’s sunny, you’re staying relatively low on the hills and the forecast is good, then wear shorts; otherwise it’s trousers. 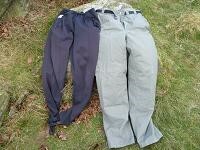 Some trousers seem to get wet quickly in the rain, but dry out quickly. Others never seem to get wet at all. One piece of advice that is universal: NEVER wear jeans. Jeans are a little heavier than other outdoor trousers, but that’s not the main reason not to wear them. When jeans get wet, they stay wet, become heavy and leave water next to your skin, meaning that you cool by conduction 25 times quicker than if your trousers were dry. Remember - getting cold and wet are the main causes of hypothermia. You can spend a fortune on walking trousers, but you can also get some less expensive ones that do the same job. If you're thinking of spending £120 on a pair of trousers, and your navigation isn't too clever, perhaps you should spend some of that money on a navigation course and buy some less expensive trousers. Just a thought.